List Rules Vote up the actors who have convinced you dirty language can be beautiful. There's a lot of swearing in movies (and, these days, just as much on TV). The use of curse words requires the deft touch of an artist to bring life, humor, and intelligence to words that many consider base and vulgar. Actors who are good at swearing - like Samuel L. Jackson and Philip Seymour Hoffman - are treasures. There's something quite cathartic about swearing, and it can just as easily break the tension of a scene as it can build it. Of course, a pointed censorship of cursing is also a hilarious tactic, especially when it's unnecessary. There are only so many people who can pull off swearing, no matter the role, and here we celebrate their foul-mouthed achievements. Here are a bunch of actors who really know their sh*t when it comes to dropping f-bombs. Best Swearing Role: Samuel L. Jackson is famous for his salty language, which actually predates Pulp Fiction, but the Tarantino flick often gets credit for cementing his place in the f-bomb hall of fame. Of course, one of his most famous lines comes from Snakes on a Plane, the (in)famous, "I have had it with these motherf*ckin' snakes on this motherf*ckin' plane!" Best Swearing Role: No list dedicated to actors who swear would be complete without Joe Pesci. Even in the kid-friendly Home Alone, when Joe Pesci's character gets made and mumbles a bunch of gibberish, it might sound like nonsense but we definitely know what he means. While relaying a story to some of his goons in Goodfellas about his unwillingness to be a snitch, Pesci recalls, "I said... I thought I told you to go f*ck your mother. I thought he was gonna sh*t!" 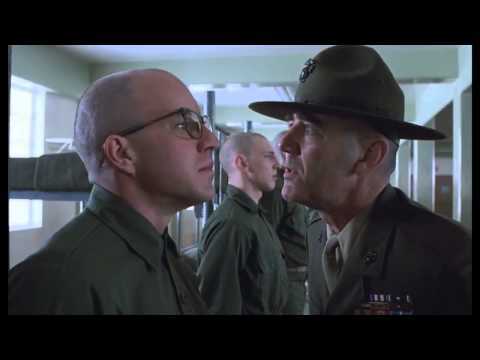 Best Swearing Role: R. Lee Ermey may not be a household name, but there's one role most people will recognize him from, the crazy drill sergeant guy in Full Metal Jacket. He was born to play the role and he did so with gusto especially in a scene chastising an unfortunate recruit saying, "Well, no sh*t... Hell, I like you. You can come over to my house and f*ck my sister. You little scumbag!... Get up! Get on your feet! You had best unf*ck yourself or I will unscrew your head and sh*t down your neck!" #17 on If You Fought To The Death, Who Would You Want By Your Side? Best Swearing Role: The Big Lebowski is chock full of curse words, and John Goodman as Walter Sobchak does his part to keep the colorful language flowing. When he brings his ex-wife's dog to the bowling alley he explains why it was necessary, saying, "This is a f*cking showdog with f*cking papers. You can't board it, it gets upset." He drops a "Shut the f*ck up" so many times in this movie and it never stops being funny.